Photo retouching software for imperfections and unwanted objects removal.The program can be installed as standalone and a plug-in as well.Retouch Pilot is photo retouching software that was designed for removing imperfections from a photo. It allows you to remove small technical imperfections - scratches, spots from dust particles and hair, etc. - that were found in the original image or that appeared while scanning the photo. Photo retouching software for imperfections and unwanted objects removal. ...... objects from a photo. You have the amazing ability to copy a "smart patch" from one part of an image to another. You can retouch any unwanted objects even on a complex background. This photo retouching software allows you to change form and proportions as well. With the Elastic tool you can get great results without image degradation when correcting your photos. With Retouch Pilot you'll be able to restore scanned old photos. Retouch Pilot allows you to remove any defects arising from long-term storage of a still picture: fixer stains, scratches and worn spots. An essential mac font management software tool. Optimize system, repair your system on Mac. 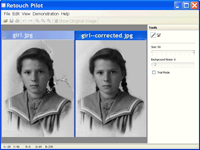 Qweas is providing links to Retouch Pilot 3.2 as a courtesy, and makes no representations regarding Retouch Pilot or any other applications or any information related thereto. Any questions, complaints or claims regarding this application Retouch Pilot 3.2 must be directed to the appropriate software vendor. You may click the publisher link of Retouch Pilot on the top of this page to get more details about the vendor.